COUPON: Buy One Get One FREE at McDonald's (Frozen Strawberry Lemonade & More!)! If you don't have a 7-Eleven nearby to grab a FREE Slurpee today, you may wanna jump on this deal instead! 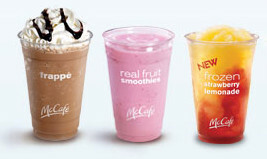 Print this coupon for Buy One Frozen Strawberry Lemonade, Frappe, or Real Fruit Smoothie and Get One FREE at McDonald's! The coupon doesn't expire until July 31! COUPON: $1.00 off 1 Athenos Feta Cheese!